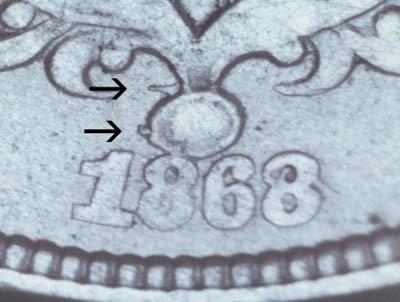 This 1868 gets the nod for the top misplaced date. Both the flag and the base of a wildly misplaced one can be seen very clearly at the left side of the ball. This coin also has the less common reverse of '68. This 1867WR gets the nod for the runner up misplaced date. 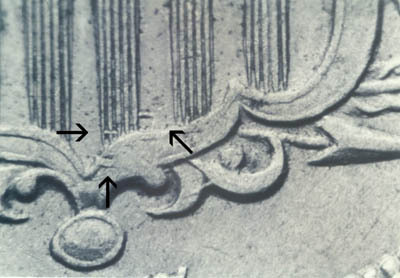 A goodly portion of a 1 is seen well up into the shield. While the date is more wildly misplaced than the top MPD, it is not quite as clearly visible. Additionally, because there already was another 1867WR and no 1868 in the Top 20, the 1868 got the nod. But it was a really tough choice to pick one of these over the other - it's close enough to just about be a tie. 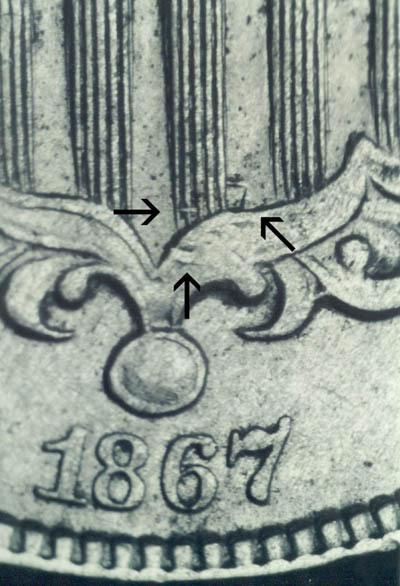 A slightly different view of the same coin.